We took Dell Harper on her first boat ride last Sunday for a Father's Day boat ride with the entire family. The life jacket was hilarious and adorable. It was so funny- I mentioned to my boss that I was ready to take her on the lake, and just needed to find an infant life jacket. He said "Oh, don't buy one, I'm sure we still have ours from when the kids were little! You can have it!" Ha! His kids are in their early twenties! A life jacket for Miss Priss is an area where my Scotch Irish parsimony will gladly give way. I marched into the marine store and demanded their most expensive infant life jacket. That little girl was a little unsure about the whole situation however, and gripped me pretty tight. A little cruising had her right relaxed. Also pretty relaxed? A lovely summer dinner of Mediterranean munchies. 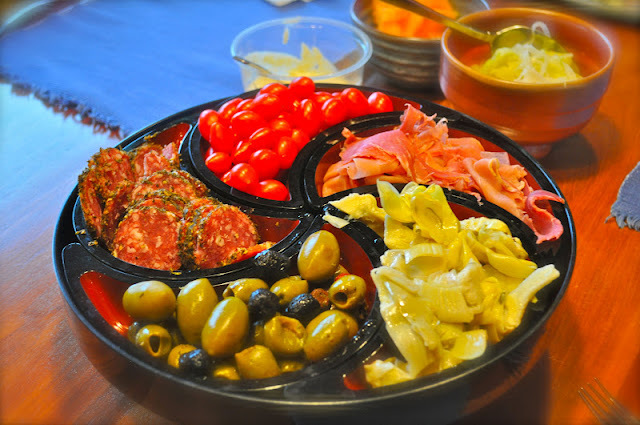 Hummus, cantaloupe, prosciutto, salami, olives, tomatoes and artichokes? I'm in seventh snacker's heaven! What else? I ordered this suit set from Lands End as part of bikini confidence post baby. I think the cami layer will help ease my c-sectioned middle into bikinis. We have a picnic at the local "splash-pad" to attend next Friday night, and I am excited to try my mama suit out. In other news the house is just about finished. We moved furniture and cleaned and arranged all day Friday. Unfortunately, Hubs' back has gone completely out in the meantime, so we are still waiting to move back in, as I need help moving a couple pieces of furniture around. Mama and I would have it knocked out in about 2 minutes flat, but she is in a cast due to thumb surgery. As I am physically incapable of hang in pictures without her, my planned gallery wall will have to wait. . . I have my eye on this bookshelf from Ballard Designs for my mudroom. in the catalog they had rain boots on it. I think it is just the right height for tossing my purse, briefcase, gym tote, pumping bag and diaper bag. I was going to put hooks up for these various items, then realized they'd probably tear the damn wall down with their combined heft! Finally, I was flipping through the latest issue of Martha Stewart Living, and these darling napkin rings caught my eye. I adore the seersucker, but think they would also be great with any fabric- a perfect way to use up all those scraps. Now I only need to re-learn how to sew. . .
Love the lifejacket shots. Why does your hair look so good post pregs and mine is way wonky?!?! That is a great bookshelf and fyi, I made those napkin rings but used flat buttons. They are great. I think I will do some for Christmas time too. I love the Ballard angled shelf for bags - I have also been envisioning hooks ripping out of the wall. and your hair does look darling! when boating, mine either looks like a rats nest or a drowned rat or is safely under a hat! cant wait to see everything when it's all done and ready to show off!! 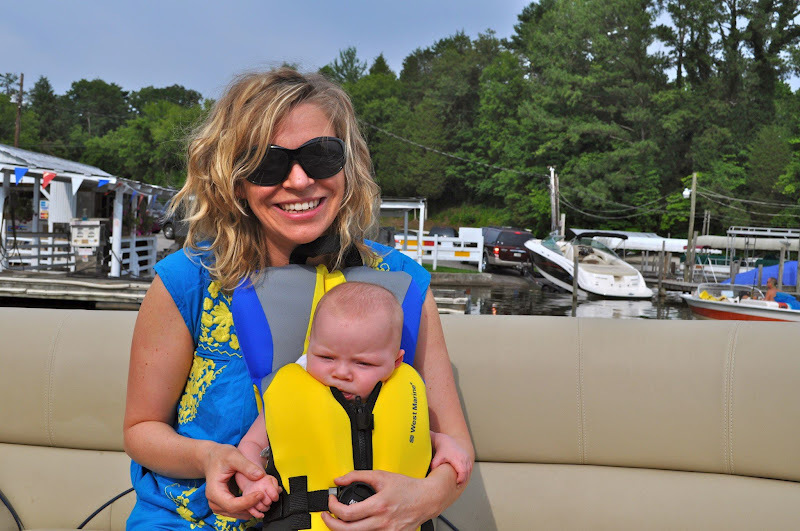 We took our little man out on a boat for the first time this weekend, too! 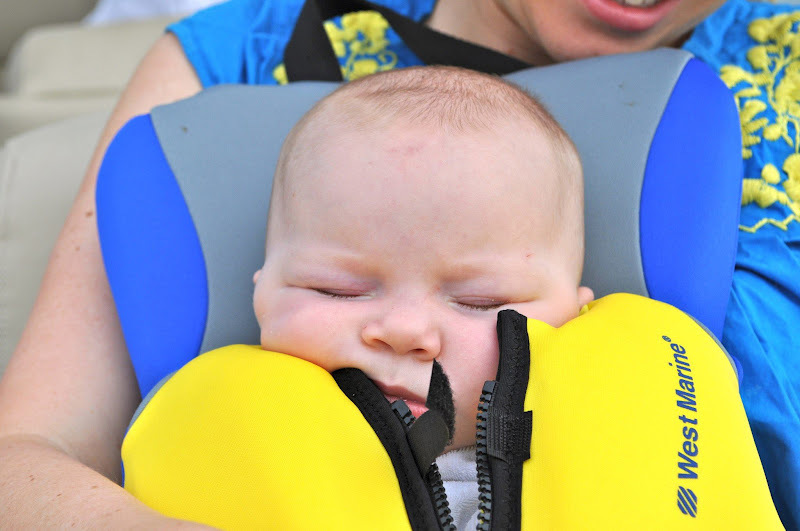 We had an infant life vest, but kept him in the baby bjorn the whole time-danger! That Ballard rack is perfect! I have a mirror with hooks in my entry, but the rack is much more practical!